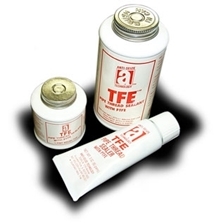 TFE™ is a superior-grade, non-hardening, heavy-duty pipe thread sealant that is easy to-apply. Formulated to a thick paste consistency, its fortified with an extra amount of PTFE and PTFE materials to give a positive seal with less effort Because of its unique solids content, TFE fills thread imperfections and provides leak-proof joints that seal for the life of the connection. Not for oxygen use. Applications: Recommended for pipes carrying water, steam, LP and natural gas, refrigerants, solvents, caustics, dilute acids, oils, diesel fuel and ethanol. Use on all pipe threads made of cast iron, malleable, brass, copper, and stainless steel. Designed for use by all pipe fitters, fabricators, plumbers, and mechanical contractors. Please call 1-800-991-1106 for 55gal Drum price. Allergen Certification: Click here to see the certification letter on this product.